You rip concert DVD to MP3 music for convenient playback on your iPhone/Andorid/car or latter burning to CD. But what depresses you is that your output MP3 file is a terrible distortion, combined with popping and intermittent sound. Or all you get is an MP3 file with single audio channel at unsatisfied audio bitrate/sample rate. That's quite annoying, right? These cases won't happen again once you extract MP3 music from DVD disc with a first-rate DVD to MP3 ripper. 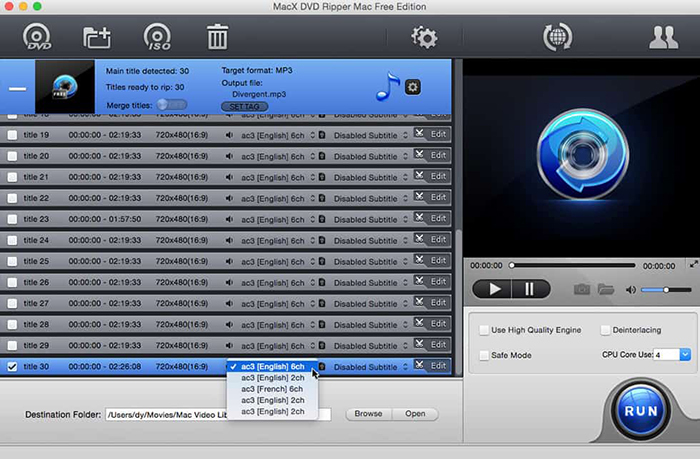 MacX DVD Ripper Free is the very one, letting you 100% free rip DVD to MP3 music with stereo channel and highest audio quality. Why MacX Can Convert a DVD to MP3 with Best Quality? It's known to all that audio quality is decided by sample rate, bit rate and audio channel. MacX DVD Ripper Free takes all these crucial elements into consideration and constantly optimize its audio ripping engine to provide you with best audio result. 1. The audio track in the most common DVD disc follows the industry standard with 44800Hz in sample rate and 192kbps in bit rate. When you apply this free DVD audio extractor to convert DVD to MP3 music, the output quality of your MP3 file is featured with default 48000Hz in sample rate and 256Kbps in bit rate, even higher audio quality than the original DVD audio track. The maximum sample rate and bit rate it supports are up to 96000Hz and 320Kbps. 2. Usually the DVD audio sports with Dolby digital 5.1 Surround (24bit) effect. MacX is well-designed to help you rip MP3 music from DVD with stereo channel so as to guarantee the output audio track with your desired surround effect. Free download the DVD ripper and run it on Mac. Then, just insert your favorite concert DVD on the DVD-ROM and load your DVD through "DVD Disc" button. Alternatively, you can hit "DVD Folder" to import the DVD you want to rip audio from. Note 1: This free DVD to MP3 converter is perfectly compatible with Mac OS X 10.5 and later, including the latest macOS Mojave and supports decrypting even the newly released protected DVDs. For windows users, please get a download of its Windows version for free. Note 2: The right main title of your DVD disc (homemade or commercial 99-title) can be automatically detected instantly without any 3rd party software help. Afterwards, you can also get deep into manually choosing the audio track you want. See, you're able to pick out the ac3 English 6ch, ac3 English 2ch, ac3 French 6ch, etc. In the output format area, select the target format "to Music" > "to MP3" > tap Done button. Of course, this freeware also makes even more formats accessible to you, including DVD to AAC, DVD to AC3, DVD to MP4, MOV, M4V, DVD to Apple TV and DVD to iTunes. 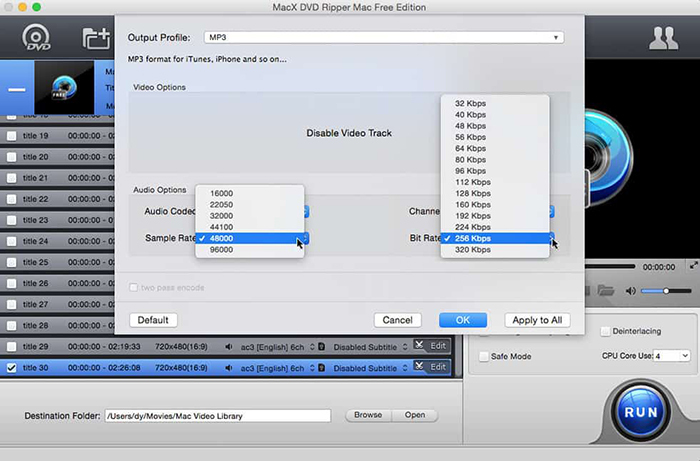 To make iPhone ringtones from DVD or directly rip DVD content to iPhone iPad Android device, you're required to upgrade to MacX DVD Ripper Pro, its pro version with 420+ output profiles with latest iPhone Xs Max, iPhone Xs/XR, Galaxy Note9, Galaxy S9+, Huawei P20 Pro, etc. covered. Step 3. Adjust MP3 Audio Settings to Ensure Best Quality. Tap Settings icon next to the music symbol at the main home and you'll be directed to the setting adjusment interface. Here you're allowed to freely increase sample rate from the default 48KHz to 96KHz and change bit rate from 192Kbps to 256/320Kbps. Or instead, just keep the default settings if you're new to this part. Step 4. Set Output Folder. Click "Browse" button to choose the path where you want to save the output MP3 files in. Step 5.Convert DVD to MP3 on Mac Now. When the settings are done, press "RUN" button to start the conversion on your Mac computer. It will automatically rip DVD audio to MP3 on Mac and then you can playback on your iPhone iPad Android/car or burn it to CD for further usage. Rip DVD Movie to MP3, AAC, AC3. Support all types of DRM (CSS, region code, Sony ARccOS, UOPs, RCE, Disney X-project protection, etc). Built-in 420+ profiles for popular devices; Convert DVD to iPhone Xs Max/Xs/XR, Samsung Galaxy Note9, Galaxy S9 edge, Apple TV 4K, Sony, Google Pixel series, PS4, Xbox One, etc. Clone DVD to ISO image at 1:1 ratio. Copy full title/main content to MPEG2/MKV at fast speed. Update constantly for recently released DVDs. Support all knotty DVDs, be it 99-title DVDs, workout DVDs, Japanese adult DVDs, TV series DVDs, unplayable or damaged DVDs. Make full use of Intel QSV/Nvidia/AMD and fast rip a full-length DVD movie within 5 minutes only! (Ripping speed depends on the drive speed and computer configuration greatly. I bet most people want to listen to the audio on phones or pads on the go. Of course, MP3 is compatible for mobile devices, but it doesn't mean that you can easily enjoy your audio tracks on iPhone iPad. 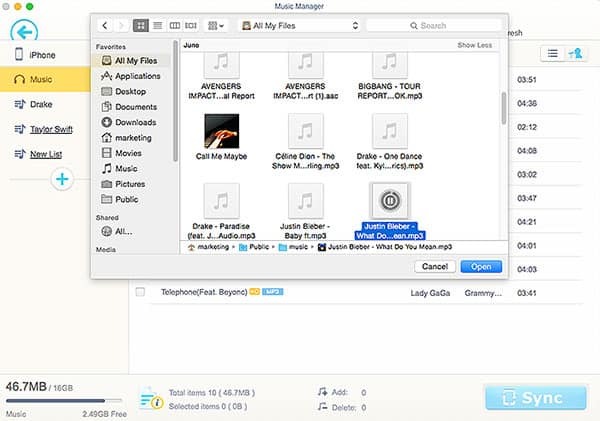 Many Apple users resort to iTunes to transfer mp3 to iPhone iPad. But actually, things are not as easy as you think: iTunes are complicated, time-comsumed and it even puts you in danger of lossing data especially for music not purchased on iTunes. Edit music information, including title, artist, album, composer etc. Connect your iPhone to Mac with a USB cable, and click "Music Manager " on the main interface > Click "Add Music ", then a window will popup > Select the songs on local Mac computer and then click "Open " > Tap "Sync" and the new added songs will be synced to iPhone. Handbrake aside, you can download another top free DVD converter for Mac to rip and convert copy protected DVD to MP4, MOV, iTunes ProRes, Apple TV, MP3, etc. after auto removing CSS, Disney X-project protection, Sony ARccOS, Region Code, etc. DVD encryption tech.